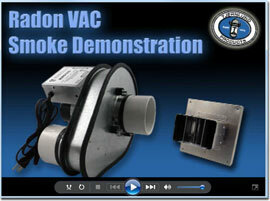 The Radon VAC™ provides the first effective and affordable way to reduce radon levels in existing homes. The unique system consists of a plug-in fan, exterior hood and installer-purchased PVC pipe. Because the Radon VAC side wall system evacuates through the basement side wall, homeowners can avoid the cost and hassle of PVC pipe run vertically through living areas or outside of their homes to the roof line. Requires only a 4" hole through wall. Fan and hood connect directly to 3" PVC pipe. Just plug in the 6' power cord to operate. Tjernlund is the originator and leading manufacturer of Side Wall Vent systems for gas and oil heaters. Now, Tjernlund has developed the first engineered solution for Side Wall Venting radon. PSC permanently lubricated ball bearing motor is not exposed to moisture in the air stream. Uses only 50 watts. Engineered to reduce radon across a variety of sub-slab soil types (dirt, sand, gravel, etc.). Features 6’ power cord. housing and powerful backward inclined steel impeller. Why terminate on an outside wall instead of above the roofline? Retrofitting an existing home with a typical EBM fan powered mitigation system can be expensive and/or aesthetically unpleasing because of the PVC materials needed to terminate the system above the roof. Many affected homeowners do not have the funds available to devote to these traditional mitigation methods which cost anywhere from $1,500 to $5,000 installed. EPA studies show less than 15% of the homes that exceed recommended radon levels have an active mitigation system. The Radon VAC requires no exterior PVC saving both material and labor costs while at the same time minimizing the effects on the home’s appearance. Why is it typically recommended that the fan be outside or in the attic? Since sealed fans were not used in original studies, a bias for putting the fan outside the living space was developed. From a practical perspective fans installed in the attic stand little chance of being inspected for operation or serviced. Temperature extremes in attics and in cold weather climates also are an extremely undesirable environment for operating a motor. Exterior PVC is susceptible to moisture and freezing problems. When using a standard fan to exhaust near the ground level problems can develop for installations that have restrictive soil densities and/or extensive PVC pipe runs. At lower flow rates the discharge velocity can drop below that needed to fight wind loads and propel the gases away from the home’s exterior. Tjernlund’s adjustable Variable Aspiration Control hood lets the installer increase dilution and discharge velocity on lower flow applications. This allows for the radon to be discharged and diluted in a jet of air regardless of soil density. Beyond the engineered VAC hood our installation instructions state minimum distances from doors, windows and fresh air intakes to avoid recirculation issues. These distances have been used for decades to avoid recirculation of exhaust gases from side wall vented gas and oil fired furnaces, boilers, water heaters and fireplaces. See the RMS160 instructions for an illustration with specific clearances. Is using the Radon VAC against code? No. The International Building Code (IBC) and International Residential Code (IRC) do not address Active Slab Depressurization (i.e. Fan-Powered Systems) as a radon mitigation technique. Some institutions (e.g. EPA) offer guidelines and recommendations for radon mitigation techniques when using basic fans, but these organizations do not regulate radon mitigation. You should always follow local building codes. In absence of these codes follow the IBC and IRC. -Radon is a colorless, odorless, cancer-causing radioactive gas that naturally occurs in the environment. It is produced by the decay of uranium in the soil and rocks below the earth’s crust where it is released into the air and water. -Radon is measured in pCi/L (picocuries per liter of air), a measurement of radioactivity. -The average indoor radon level is 1.3 pCi/L while the average outdoor radon level is about 0.4 pCi/L, but can vary from site to site. -At an estimated 21,000 deaths per year, radon is the second leading cause of lung cancer in the United States. Only smoking causes more deaths. -When radon decays, it expels alpha particles. These small, heavy, electrically charged sub-atomic particles consist of two protons and two neutrons. If an alpha particle attaches itself to the chromosomes in a lung cell, it can alter the way that cell reproduces. -Radon can seep into your home from the soil beneath it through dirt crawlspaces, cracks in the foundation and walls, floor drains, pipes and sump pump pits. If you get your drinking water from a well, it can also be a source of radon in your home. -Houses act like large chimneys. As the air in the house warms, it rises to the attic and exits through cracks, openings and around the upper floor windows. This creates a small suction (“vacuum”) at the lowest level of the house, pulling the radon out of the soil and into the house. -Underground well water can transport the radon from the soil into the house at any time when running water (e.g., taking a shower, doing laundry, washing dishes, etc.). The EPA says it takes about 10,000 pCi/L of radon in water to contribute 1.0 pCi/L of radon in air. -If your water comes from a city supply, there is no need to worry about radon in the water. When radon in water is stored in a reservoir for more than 30 days, the radon decays away to practically nothing. Every 3.825 days half the radon disappears through natural radioactive decay. -Testing is the only way to know your home's radon levels. There are no immediate symptoms that will alert you to the presence of radon. It typically takes years of exposure before any problems surface. -There is no safe level of radon. The EPA recommends mitigating radon in a home when levels are at, or exceed, 4.0 pCi/L. In addition, the EPA says to consider action if the level is 2.0 to 3.9 pCi/L. -Testing should be done in the lowest level of the home that is regularly used. -Short-term tests are a quick and inexpensive way to measure for radon in a home. They are typically left in place for 3 to 7 days. -Long-term tests, often called an “alpha track,” should be left in place for a minimum of 90 days and up to 12 months. Long-term tests provide results that reflect the average amount of radon in the home during a year. -Retesting should be done every 2-5 years or if any major changes to the home have been done (e.g., finishing a basement, addition, new heating system or adding central a/c). -Even homes in areas considered at low risk for radon can have high radon levels. About 15% of homes in the U.S. have radon levels above 4.0 pCi/L. -All types of homes have radon, even new construction. Do not assume that just because your neighbor’s levels are low, that yours will be also. -Changes in season, temperature, rainfall, wind and barometric pressure can all affect the radon concentration level. -The main goal is to make the exhaust vent a better “vacuum” than the house is. -Active Soil Depressurization is where a fan is used to exhaust radon from the home. There are 6 different types of ASD: Drain Tile Depressurization, Sump Depressurization, Baseboard Depressurization, Block Wall Depressurization, Sub-slab Depressurization, and Sub-membrane Depressurization. -Drain Tile Depressurization is used where drain tile is present in an application. The mitigation system is tapped into the drain tile tube around the perimeter of the house. -Sump Depressurization is also used where drain tile is present. This system is tapped into the sealed sump pit cover to pull radon out through the drain tile. -Baseboard Depressurization may be appropriate where a French drain is present. This option is rarely used today. -Block Wall Depressurization uses the hollow block wall foundation. The system is piped into the block wall to pull out radon. -Sub-slab Depressurization is used in 90% of all radon mitigation systems. This involves drilling a hole through the concrete slab to pull radon out below the home. -Sub-membrane Depressurization is used where a dirt floor crawl space is present. The floor is covered with thick plastic sheeting, which is then secured and sealed. The PVC is inserted below the plastic to pull the radon from the dirt. -Passive Soil Depressurization is where no fan is present. PVC pipe is used to create a natural chimney for radon to vent through. PSD is commonly used in Radon Resistant New Construction and almost never used in existing homes. -Radon Resistant New Construction (RRNC) is a new building code requiring all new homes to be built with additional steps taken to prevent radon infiltration. The 5 main steps of RRNC include: 4” of coarse gravel below the foundation slab; thick plastic sheeting above the gravel; a 3” or 4” PVC pipe run up through conditioned space from below slab to above roof; all openings, cracks and crevices are sealed with polyurethane caulk and a junction box is installed in the attic for use with a fan. -Seal up cracks and openings in basement floors, foundation walls, openings around pipes, etc. to prevent radon infiltration. If a home has a crawl space, install a vapor barrier over the bare soil.